The safety from the rain and the general security of your lawn mower, gardening items and the kids bikes and toys will be taken well care of with the 7′ x 5′ Traditional Pent Security Shed. This is a shed which has a look that is very uncommon thanks to those amazing looking small windows which have a lot of style, but make it hard to see what you are keeping inside of here. The shed has been designed to have a very appealing look so that it looks nice in the garden, but also have a very strong and secure presence to make thieves think twice about even trying to get inside. The storage space it offers is just ideal and it does not even need a large garden to be installed in. This is a shed which has been designed to keep your belongings safe for lots of years. Strong redwood is used to make the tongue and groove shiplap cladding as well as the frame, tongue and groove floor and even the roof boards. As well as keeping a potential thief out the materials also will not allow any water inside either. Every material that makes up this shed has been selected because of its high quality and ability to last for many, many years. 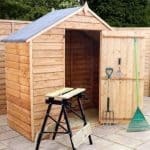 The 7′ x 5′ Traditional Pent Security Shed is here to take care of all your security needs and also make sure that any gardening gear, tools or perhaps even the kids bikes are safe from the rain and becoming all rusted. 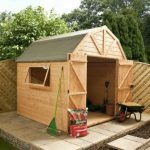 This is a very impressive looking shed which while offering what we feel is a very decent amount of storage space at 5 feet in it it’s width and 7 feet in its depth, this shed you will be pleased to know does not require lots of space to be built in. This really does make it ideal for those of you who are struggling with space in your garden, but seem to have stuff all over it and you just want somewhere nice to store it all. The height of the shed is 6 feet 7 inches at the highest point and then at the lowest point it is 5 feet 9 inches. The pent roof is something we love as it is designed so that the rain when it lands on top of it will be running right off the back. This means if you do find yourself needing to get into the shed when it is raining, you do not have to worry about water pouring off the roof onto you. The very top of the roof is covered with high quality roofing felt and underneath this we have some very solid, 12 mm thick tongue and groove boards. The redwood tongue and groove shiplap cladding that makes up the walls of this shed really is eye catching. It just has a very strong and secure look to it and at 12 mm thick it is more than durable enough to take a bit of abuse if you have kids running around, kicking footballs in the garden. This cladding does look amazing, but its interlocking design is how it prevents any water from getting inside and that is what we really love about it. The framing that Treetops Traditional have used is really quite remarkable and we must tip our hat to them for being able to put in a 44 mm x 27 mm frame and not substantially hike up the price. This frame has rounded edges which you may not notice at first glance, but trust us they are there and in the long run they are only going to help the shed stay strong and last for many years. With this being a shed that is about providing you with security, we are very happy with how robust this frame is. Just when we think we have this shed figured out it keeps throwing surprises at us like the 12 mm tongue and groove boarding which is used for the floor. This is very strong boarding and we will be honest from the outside we did not expect this high quality a floor to be used. Even heavy items are going to be able to be stored inside here and not result in the floor having any kind of issue. The 7′ x 5′ Traditional Pent Security Shed will come to you with the wood having been given a base coat treatment which is ok for the short term, but you will want to have some wood treatment on hand to coat it with within a few weeks of construction. As is the case with the other sheds from Treetops Traditional, you will be given a one year guarantee to protect you from any general wear and tear the materials may have. The door that is on this shed is going to make anyone looking to break in just walk away as it has a very high security look to it. The door is kept in its place by three very heavy duty hinges and then to keep it closed it has a padlock protector, but there is no included padlock with the shed. 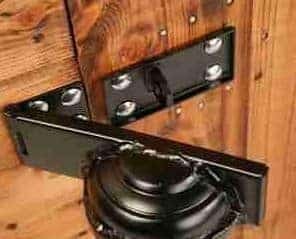 While the door is great at keeping things closed up tight. The size of the door is also impressive. At 5 feet 9 inches high and 2 feet 6 inches wide, getting things in like a mower will be very easy. We really do love the small, high quality windows that are on here. They are made from very strong, horticultural glass and their size really does make them a charming and also practical feature of the shed. Treetops Traditional have put security in the name of this shed and they are not messing around. This is one of the most well built and secure structures that we have had the pleasure of checking out in quite some time. 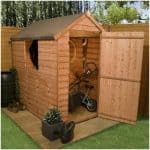 With being as secure as it is we feel that it would be the ideal shed for a person who is really serious about their gardening and has a whole bunch of expensive gardening equipment or even a family who want somewhere safe to lock up the children’s bikes. Security is the main concern of this shed, but privacy is also pretty high on the list. Those awesomely small windows look fantastic, but they also do not allow people who may be walking by to be able to easily see inside and think they might help themselves to that cool looking mountain bike you have. It is pretty amazing just how many different styles of wood treatment there are. You can paint a wood pretty much any colour under the sun these days and we feel this is a great way to add your own little bit of personality or attitude to the shed all the while protecting the wood from the bad weather. Treetops Traditional do offer two extras with this shed. First up we have their wooden floor bearers. These will cost you an extra £24.99, but they will provide the floor of the shed with a bit more backbone and also be ideal if you are building the shed on a surface that is not too sturdy. They also offer an installation service where for £94.99 when the shed is delivered it will also be installed for you. The redwood used is very high quality which you can tell from the first moment you touch the shed. 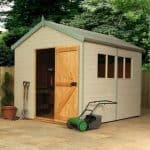 You will be able to get a couple of decades at least out of this shed as long as you take proper care of it by treating it annually. We have seen far larger sheds, but this one is more about the security it provides than the size. 7 x 5 is still enough room to store many items it just means that you will have to plan things out a little bit before you put them in there. Even if you do not go for their installation service this is a shed which is not going to cause you to many problems. 2 -3 hours is the average time this takes to build. 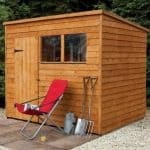 If keeping things secure is what you want in a shed then the value for money that this shed offers is more than fair. Final Thoughts: We really do like what Treetops Traditional have done with their, 7' x 5' Traditional Pent Security Shed. 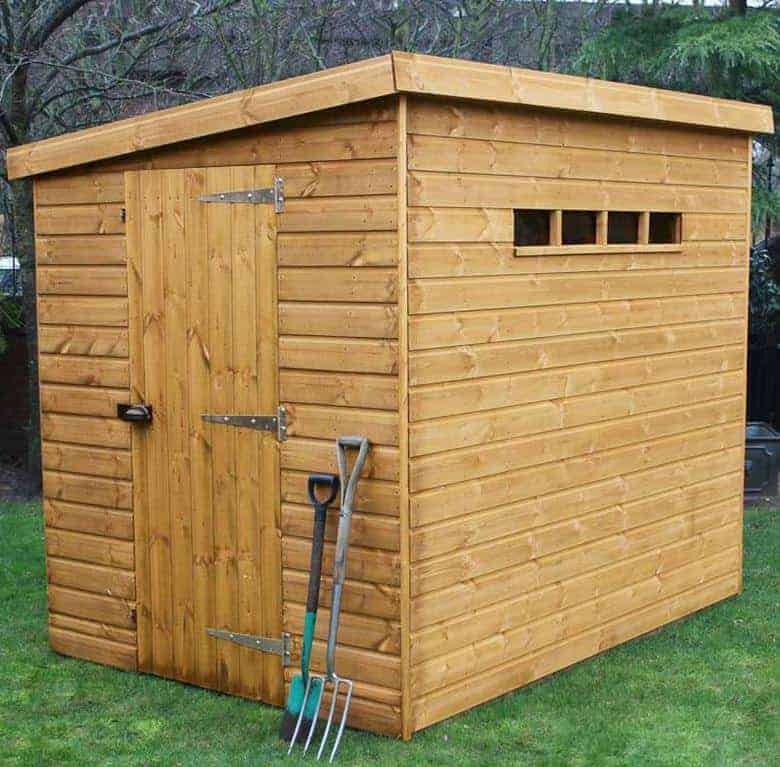 The security that this provides a person who likes to look after their tools or even a family who wants to make sure the kids toys and bikes are safe is what makes this shed such a great purchase. The look of the shed is very intriguing and those small windows really do have a big personality and we are sure they will be something people point out when they see the shed. 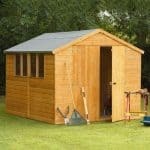 In all this is a shed which we impressed us and if you want to keep a few things safe and do not want to spend a huge amount of money doing so then we think this is the shed for you.